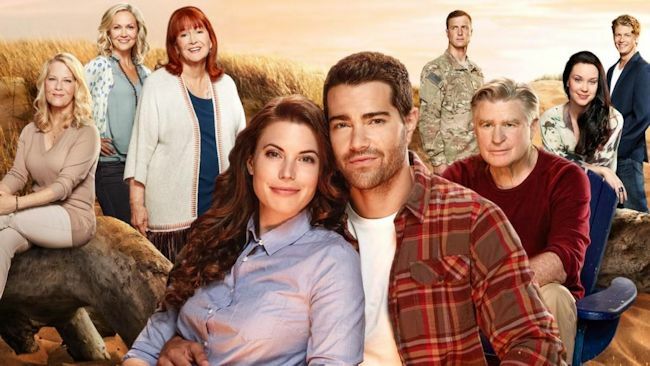 Hallmark Channel's hit primetime series Chesapeake Shores returns for Season Three Sunday, August 5 (9pm ET/PT, 8C) and runs through October 2018 with new episodes every Sunday night. Chesapeake Shores is part of the network's "Summer Nights" programming event. Based on the novels of the same name by New York Times bestselling author Sherryl Woods, the series stars Jesse Metcalfe (Dallas), Meghan Ory (Once Upon A Time), Golden Globe(R) nominee Treat Williams (Everwood, Hair), Academy Award(R) nominee Diane Ladd (Wild At Heart), Barbara Niven (Cedar Cove), Laci Mailey (Falling Skies), Emilie Ullerup (Sanctuary), Brendan Penny (Motive) and Andrew Francis (Final Destination 3). Gregory Harrison (One Tree Hill), Victor Webster and Jerry Trimble return to guest star in season three. The CW has shifted premiere dates for the summer. 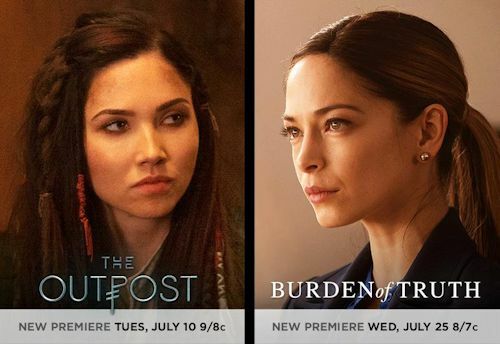 The Outpost will premiere Tuesday, July 10 at the newly scheduled time of 9:00pm ET, while Burden of Truth will now premiere on the new date of Wednesday, July 25 (instead of July 11) at 8:00pm ET. Burden of Truth stars Kristin Kreuk (Smallville, Beauty And The Beast) as a big city lawyer who returns to her hometown to take on what she thinks is a simple case, only to find herself in a fight for justice for a group of sick girls. Burden of Truth also stars Peter Mooney (Rookie Blue), Alex Carter (NCIS), Benjamin Ayres (Saving Hope), Nicola Correia-Damude (Shadowhunters: The Mortal Instruments), Meegwun Fairbrother (Hemlock Grove) and newcomer Star Slade. And The Outpost follows Talon (Jessica Green, Ash vs Evil Dead), the lone survivor of a race called "Blackbloods." Years after her entire village is destroyed by a gang of brutal mercenaries, Talon travels to a lawless fortress on the edge of the civilized world, as she tracks the killers of her family. On her journey to this outpost, Talon discovers she possesses a mysterious supernatural power that she must learn to control in order to save herself, and defend the world against a fanatical religious dictator.